Clean lines in this traditional Mt. 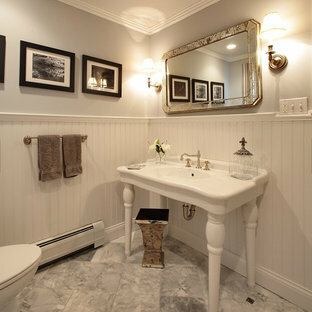 Pleasant bath remodel. 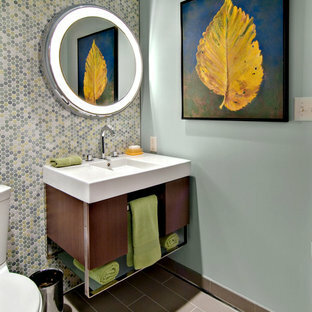 This bathroom reflects a current feel that can be classified as transitional living or soft modern. 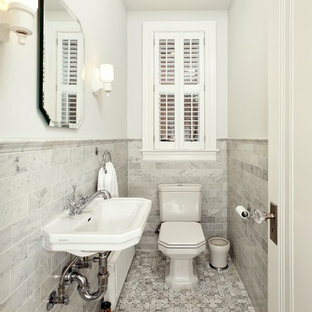 Once again an example of white contrasting beautifully with dark cherry wood. 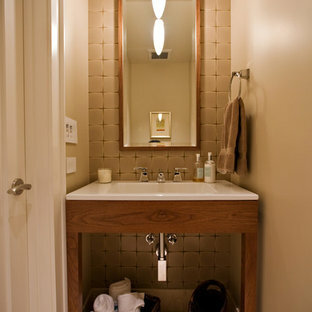 The large bathroom vanity mirror makes the bathroom feel larger than it is. 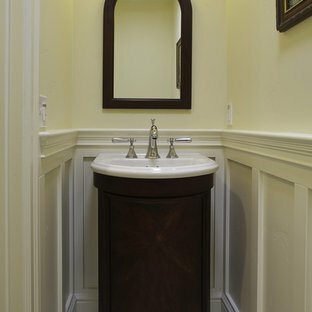 Powder room with table style vanity that was fabricated in our exclusive Bay Area cabinet shop. 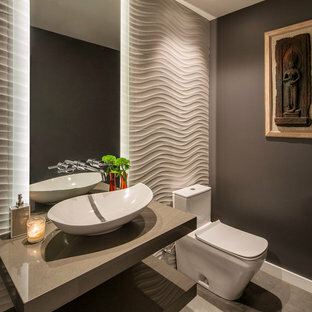 Ann Sacks Clodagh Shield tiled wall adds interest to this very small powder room that had previously been a hallway closet. 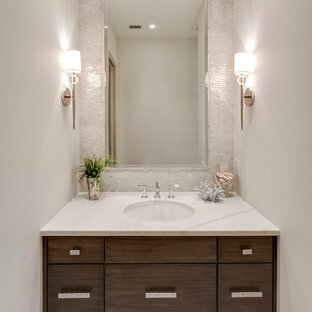 Wainscot paneling, furniture vanity, Marble top, and vessel sink brings the new and old styling together. Cabinetry fabricated by Eurowood Cabinets. Design by Carol Luke. Breakdown of the room: Benjamin Moore HC 105 is on both the ceiling & walls. 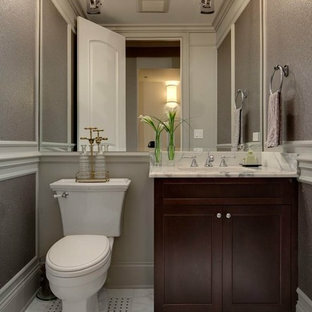 The darker color on the ceiling works b/c of the 10 ft height coupled w/the west facing window, lighting & white trim. Trim Color: Benj Moore Decorator White. Vanity is Wood-Mode Fine Custom Cabinetry: Wood-Mode Essex Recessed Door Style, Black Forest finish on cherry Countertop/Backsplash - Franco’s Marble Shop: Calacutta Gold marble Undermount Sink - Kohler “Devonshire” Tile- Mosaic Tile: baseboards - polished Arabescato base moulding, Arabescato Black Dot basketweave Crystal Ceiling light- Elk Lighting “Renaissance’ Sconces - Bellacor: “Normandie”, polished Nickel Faucet - Kallista: “Tuxedo”, polished nickel Mirror - Afina: “Radiance Venetian” Toilet - Barclay: “Victoria High Tank”, white w/satin nickel trim & pull chain Photo by Morgan Howarth.